I cook the whole Thanksgiving meal every other year. On the years I don’t cook we go to the extended family’s place & I bring a dish or two. Some years I go with a theme for my Thanksgiving dinner. One year I did a Mexican theme (based on Turkey Mole, and then all the sides had a little Mexican twist, like Chipotle Mashed Sweet Potatoes and Corn Pudding with Roasted Poblanos). Last time I cooked I did a Pacific Northwest theme. This year I decided to go traditional. All (or mostly all) dishes I’ve made before. I don’t think I’d say simple, but certainly traditional. Here’s the full menu for T-Day 2012! 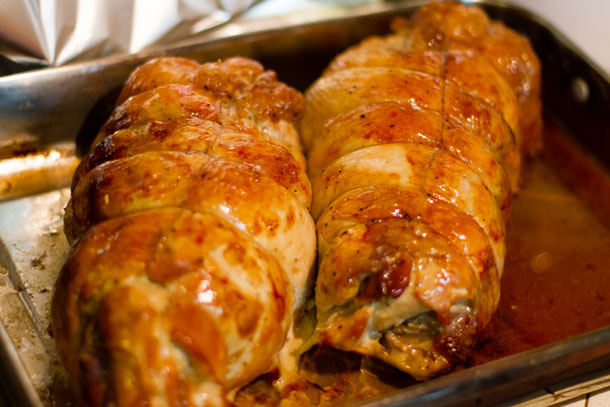 Roasted Rolled Turkey, ready to be carved, served, and devoured. 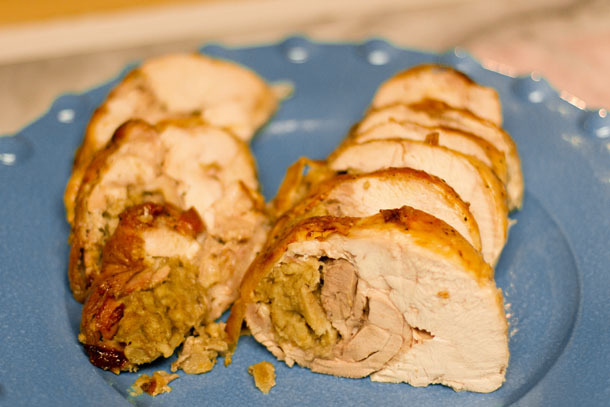 If you make 2 rolls like this, the turkey takes very little roasting time. Check the temperature after 45 minutes. And, you may need to cover with foil as well. — We’ve done the rolled turkey a few times before. It stays a bit more moist than roasting a whole bird. It’s also nice because you don’t have to spend all that time carving the bird while the guests wait. Just give yourself some time to debone the bird, and understand it may not be that easy, but it’s really cool in the end. 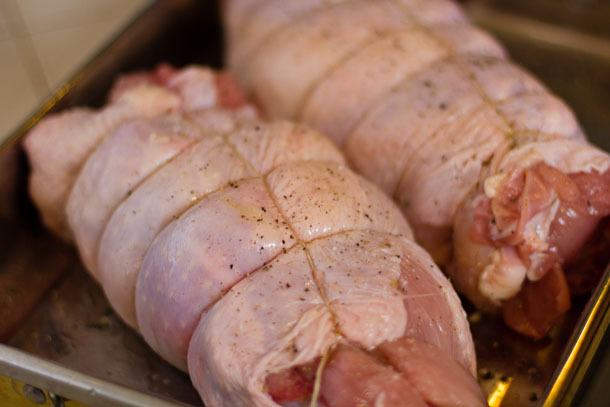 We decided to do two rolls, and with 2 rolls it takes very little roasting time. Check the temperature with an instant read thermometer after 45 minutes. Also, you may need to cover the turkey with foil to keep it from browning too much. And, I glazed the rolls with 1/4 cup of maple syrup, which gave the turkey a nice sweet skin, kinda like a Honeybaked Ham. Baked Barley… a great nutty side dish that can be made ahead. This is a photo from a prior time I made it with mushrooms. This time I used carrots instead. When I went to the store they had purple Sweet Potatoes, so I got one for these Roasted Veggies. That’s it! (hee hee). Honestly, the one thing I missed was the cukes and onions. But, I promised my husband that he wouldn’t have to smell it (it’s pretty pungent!). Otherwise, the night was great. I was happy to have all dishes I’d made before. No stress! 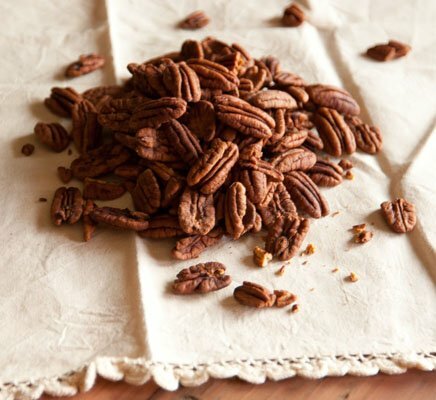 A round up of all things Thanksgiving, with appetizers, salads, soups, breads, main dishes for vegetarians and meat eaters, all the way to dessert! How was your Thanksgiving? I hope it was wonderful!